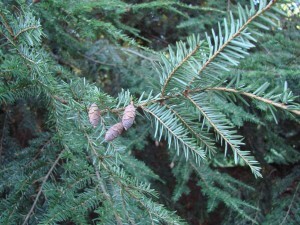 Woolly Adelgid is an aphid-like insect that is a serious pest of the Eastern Hemlock, Tsuga canadensis, and its cultivars. Adelgids need to be controlled as this insect spreads easily and rapidly and, if left untreated, can kill a mature hemlock in 4-10 years. Adelgids, formally called Hemlock Woolly Adelgids (Adelges tsugae) or HWA, present as a fuzzy, cottony white substance on the underside of hemlock needles. This is actually a waxy filament produced by the tiny, 1/16-inch insect as a covering and protection for itself and its eggs. These insects are native to Asia, and damage trees by sucking on the sap. As damage occurs, the needles of the tree become grayish rather than robustly dark green. When infected, trees may lose their needles and will not produce new growth on the damaged branches. Because infected trees are significantly weakened, they are subject to many other infections from diseases and pests, and ultimately die. Exercising good horticultural practices is the best way to prevent Hemlock Woolly Adelgid infestations. Site your hemlock appropriately, in proper sunlight and a location where it can grow well without being cramped or crowded. Water and feed as required for optimum health, including adding extra fertilization or nutrition as required. A healthy tree will always withstand disease and insect problems better that one that is already stressed. When Adelgids are present, apply insecticidal soap or horticultural oil in early April and again in June. Be certain to follow manufacturer instructions carefully and reach the underside of the needles where the Adelgids are located. When spraying in June, do so on a cooler, overcast day so as not to burn the Hemlock needles. If your Hemlock is too large to handle on your own, contact a trusted and licensed tree-care professional for treatment. Even after you have controlled an outbreak, annual spraying is recommended to be sure the pests do not reappear. Foliage Sprays: These insecticides are sprayed over the entire tree to coat the foliage. They are stronger than soaps or oils and may be effective for 2-4 years. Higher toxicity can lead to other problems and contamination concerns, however, and applications should only be done by experienced professionals. Soil Drenches: These are insecticides that are specially formulated to be absorbed by the tree’s roots and then will be consumed by the Adelgids as they sip on the tree’s sap. This can take longer to be effective, however, but it has long-lasting impact to control these insects. They should not be used where water sources may be inadvertently contaminated. In some areas, predator beetles have been released to consume Adelgids, and while this is not yet effective on a widespread scale, there have been positive reports and limited success. Hemlock Woolly Adelgids are a vicious, invasive pest, but with proper control techniques, their invasion can be stopped and the majestic hemlock forests renewed and restored.